Travelling Australia is something we have always wanted to do. However, work commitments, raising children and study got in the way and there was never a ‘right’ time to hit the road. We finally bit the bullet, sold our house as we wanted to relocate, bought a caravan and set off with 3 kids aged 3, 2 and 6 months. Crazy right?! But, the best decision ever! We travel in a Jurgens Narooma caravan and our tow vehicle is a 2017 Mazda BT50 dual cab ute. So far we have done a full lap of Oz and been on the road since Dec 2015. We left from gorgeous Newcastle, NSW and headed north. We chose to go anti clockwise to do Cape York at the start of the dry season and to miss the migration of travellers heading south and across the bottom. We are very happy we made this decision as we didn’t have to plan out where we were going to stay or book caravan parks in advance. Although it was hot up north (thank you air con), we didn’t encounter much rain at all. Your Van Is Your home! Make sure when purchasing a caravan, that it suits your needs. We knew that we would be on the road indefinitely, therefore, it was essential to have a shower and toilet and a washing machine on board. This eliminates the trek to the shower block and toilets every day (with kids in tow). Having our triple bunks all set up was an absolute must. Pulling up for an overnighter to push out and make beds wasn’t an ideal situation for us. So, with the necessities sorted, our Jurgens Caravan ticked all the boxes. It goes a long way to making the trip enjoyable. Our triple bunks in the Jurgens Narooma. 2.Teamwork for the set up and pack up routine is essential, as well as patience!! Not only that, but the biggest of all, reversing your caravan. Much patience is needed for this situation as both reverser and guider can get very frustrated. 3. Be prepared for the Adjustment period of living in your van full time and being in a confined space with others. 4. Essential items for set up – Good floor matting, a few 240volt leads to reach every powerbox, a water hose and waste hose for the van and a flexible one for an outdoor shower. A rage of different fittings and hose bags to store them, a filter housing for dirty/bore water, levelling ramps, an impact gun for stabiliser legs, a rage of different pegs and a good whacker, a trailer coupling lock to deter theft. 5. Safety. Making sure your van is safe to hit the open road is a necessity. Doing checks to make sure you caravan and tow vehicle are in working order and everything is secure. A checklist is a great way to remember your checks, those including, removal of chocks, jockey wheel, locking all hatches and doors, secured items inside the caravan, tyre pressures are good and all lights are functional. The stunning Turquoise Bay, WA. Ningaloo Reef/Exmouth – The Cape Range National Park on the West Coast of Australia is an amazing adventure with its epic coastline hard to beat. It’s crystal clear blue waters and white sands, to the colours of the cliffs that form Yardie Creek. The campsites are well maintained and campground hosts are a wealth of knowledge and lovely people. These sites are self sufficient with no power and water available. The unreal fishing, snorkelling and the warm weather has us calling to return. Margaret River – This region is absolutely spectacular! Margaret River, Western Australia is a small town located 3 hours south of Perth. It is largely known for its craft breweries, boutique wineries and epic surf breaks. Not to mention a strip full of attractions, cafés and restaurants. The town itself is a short 10 min drive from the regions coastline that hosts some beautiful whales between the June and November months. Be sure to check out one of the many caves on offer and join in for a guided tour. Valley of Giants, Walpole, WA. There is so much to do in Margaret River and the scenery around the area is green, lush and diverse. There’s also loads to do with your kids and a real sense of adventure! One of the best kid friendly areas in Australia, Margaret River is definitely a place to holiday with your family! 3. Agnes Water – Located in Central Queensland and on the coast 70km north of Bundaberg, this tourist town has it all!! Situated at the southern end of the Great Barrier Reef the stunning coastline and great surf aren’t to be missed. Walking through the town it has a great vibe and a real holiday feel. 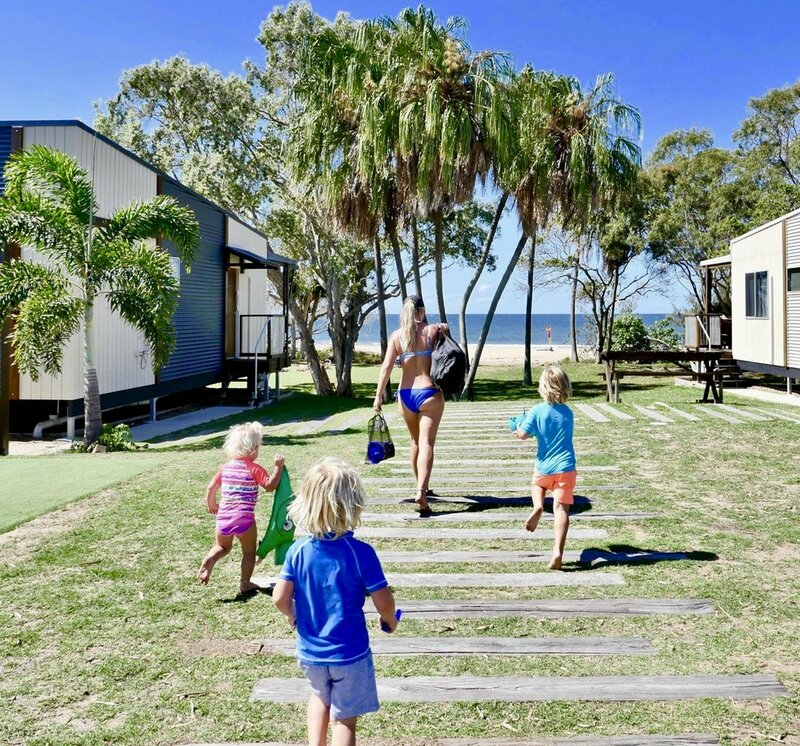 Be sure to stay at the well maintained Agnes Water Beach Caravan Park and get your tinny out for some awesome fishing. The Park is Situated right by the beach and has a great little café on site serving your daily hit of delicious coffee. 4. Cape York – The trip to this remote area of Australia is one of the best! The adventure is full of campfire tails of epic 4WD tracks, awesome fishing stories, unreal camp spots and beautiful scenery. The journey up and back definitely lives up to expectation, although its a huge amount of kilometres, it’s well worth it! Our advice – talk to as many people as you can, this is how we found some great camp spots. Its not all about the main roads and iconic locations, slow down and enjoy the area as there is more to see than you think! 5. Broome – We love this place for so many reasons. From the well-known Cable Beach to the views at Guantheaum Point, take these in while 4WDing up the sand. The fishing is simply incredible and our favourite spot to catch your bag limit of Barra is at Willie Creek. The sunsets are stunning and the camel rides add to the experience of Cable Beach. Head to Cable Beach Caravan Park where you’re only a short stroll to the beach and The Sunset Bar and Grill. Enjoy a meal, grab a beer and appreciate the gorgeous sunset. We hope that you can one day get to our top 5 destinations and that the tips help you on your travels are Australia!